I didn’t want to change anything with respect to plotting, character, world building, magic, setting, etc. Quite the opposite: I wanted to be faithful to the original story. The LonTobyn books had — and still have — a lot of fans, and I didn’t want to change things that those fans might remember fondly. My purpose in editing the books was to clean up the writing so that the other elements of the story could really shine. The 2016 Blog Tour has returned to the site of my friend, Ken Schrader, who has been kind enough to host me for another short interview. The last time I was with Ken, the Author’s Edit of Children of Amarid, the first book of my Crawford Award-winning LonTobyn Chronicle, had just come out. 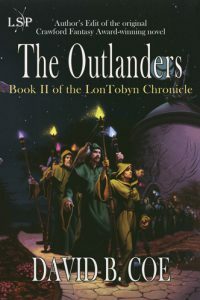 Now we’re marking the re-release of the second book, The Outlanders. This is also an Author’s Edit (think “Director’s Cut”) and this book, which has long been one of my favorites, reads better than ever. You can find the new interview here. 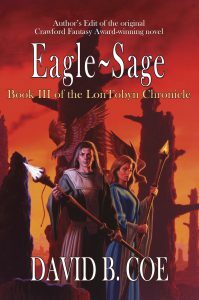 And it’s worth noting that the third book in the series, Eagle-Sage, has just been released in ebook format. The paper edition should be out before long. That’s right, the whole series is available, and just in time for the holidays. Woot! Check them out. And thanks so much to Ken for welcoming me to his blog. This entry was posted in Appearances, Business of publishing, Fantasy, Friendship, Novels, Publicity, Publishing, Writing, Writing Life and tagged blog tour, Children of Amarid, D.B. Jackson, David B. Coe, Eagle-Sage, interview, Ken Schrader, LonTobyn Chronicle, Lore Seekers Press, The Outlanders, writing, writing life. Bookmark the permalink.